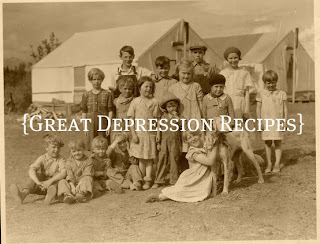 So here it is, as promised...a dinner meal plan using Great Depression Recipes! I planned about 5 days worth of dinners. During the Great Depression meat was hard to come by for some people, unless you lived on a farm. Some of the recipes are meatless, but very filling. Although they are slightly larger than an average meal might have been back then, I am including some great recipes that do save money. Here is the amazing thing about planning my meals this way...I have virtually nothing on my shopping list this week! I do freeze, can, and preserve from the garden each year and I'll be using what I have in storage. We also raise our own pork and have a half of a beef in the freezer. I am guessing that 75 years ago a farm family would have had much the same in stock:). They probably had easier access to milk, butter, and cheese, too. I tried to stay true to my research in how people ate from that period...but I also had to take into consideration my growing boys and husband with hollow legs:). This week I will be posting the recipes and letting you know how much we liked...or didn't like...the meals! I think all of these meals sound delicious! Can't wait to read your reviews!!! This is gonna be so much fun! Wishing you a wonderful start to the school week! Sounds yummy! Can't wait to see the recipes and see what your family thought. I do find too that when we go back to more basic menus our shopping list and grocery bill go down. Good things! Some of those sound really interesting. Can't wait to see how your family likes them. Hope you will share some of the recipes. I look forward to seeing the recipes! It sounds delicious! Yes, do share if you can! Those all look yummy! And, I'm always in need to new meal ideas. What a neat idea to research. Mashed potatoes and hamburger gravy is something I've made for my family and we loved it. Sounds like a great experiment. THis is so awesome..I am so in the mood for some new and different recipes and so TIRED of paying an arm and a leg for groceries at the grocery store! We have to get serious about shopping and planning with the prices going up and up these days....thanks for this post!